Well, it’s Friday, and another weekend is upon us. Here in the States, we have a long weekend because Monday we are observing Memorial Day to honor our soldiers who gave their lives so that we may enjoy our freedom and way of life. We don’t have any special plans for Monday, so we’ll probably put up our flag and take it easy at home. Last night a huge storm passed over the area and dumped a lot of rain down on us. It was pretty scary and there’s a lot of flooding, although the area that our house is in is not in any danger. But it is still scary because we live on the edge of tornado country.  I imagine that with climate change happening more quickly than we thought, the severe weather will only get worse. Scary to think about! 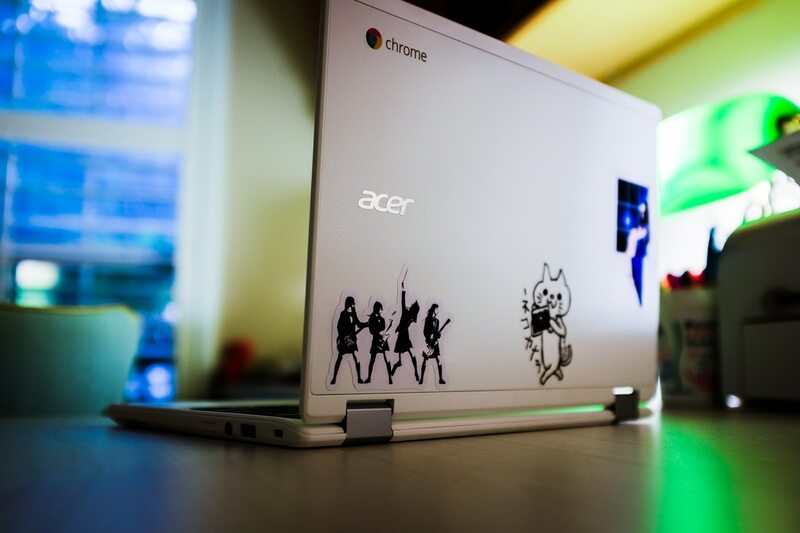 Anyways, today’s photo is of my Chromebook which is still very useful. I am actually using it right now to type this blog post! I realize that one of the things that is important to me in my electronics is battery life. That’s one reason I love my Kindle (lasts months on a single charge) and my Chromebook (10 hours continuous battery life!). I also realize that I cannot just use a tablet as my main mobile device because I need a real keyboard. The laptop form-factor is perfect for me to work on my blog. But, I know that I need another more robust computer as well, to run Lightroom and store all my photos, handle backups, downloads, and general computing. So, a two computer setup is essential at this time in my life. Well, I am going to read my book. It’s an action-packed fantasy page-turner! I am enjoying “Furies of Calderon” very much so far. A few years ago when I needed a new laptop, I got a Toshiba Portege, because I needed a laptop light enough to carry around all the time. But then last year, I finally got a tablet, the LG G Pad X8.3, and with an inexpensive AmazonBasics Bluetooth keyboard (and I got the “Apple” one by accident, but it’s always worked fine with all my Android devices, though they have a specifically Android one too), I’m all set for writing/blogging/whatever on the go. So now the laptop lives at home. 🙂 You should look into the keyboard my friend! I have a tablet too, and I bought a bluetooth keyboard to go with it. It works ok, but I didn’t like setting it up, which meant turning on the tablet, angling it using the case, then turning on the keyboard… I know, not really too bad, but flipping open the lid on the Chromebook is easier for me, and the keyboard is much nicer than my bluetooth one. This Chromebook is really light and portable too. It looks like you have a nice setup as well… perfect for on-the-go!